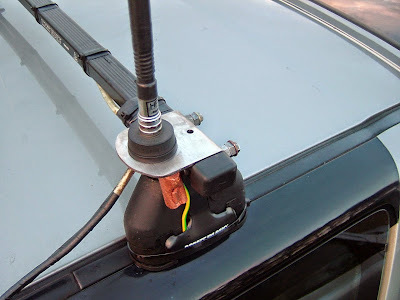 I have always used fixed mounts on my vehicles for both HF and VHF antennas which are the boot mounted grub screw type to ensure a good ground is obtained. The only snag is the corrosion that an take place beneath the mount and not forgetting the wibble wobble whenever I opened or shut the back door. I decided to fabricate my own mounts which would bolt to the roof bars giving an extra 5” (127mm) height above the existing mounts. To prevent any further corrosion problems I decided to use 3mm stainless steel as the material which took a bit of drilling but easy enough at a very low RPM using a radial drill. Once I removed any burs I bent the mounts into a right angle and mounted the stainless plates as far apart as possible on the roof bar. Each of the mounts is drilled in line to match holes in the roof bar (2 holes each mount) which I bolted up tight. 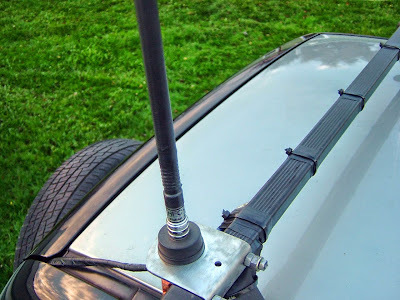 The antenna mounts went on to the stainless mounts nice and straight, I fixed a short grounding wire to the locking nut on the antenna mount which I fed to a close by bolt that was connected to the vehicles chassis. The SWR was 1:1 on 20M and whilst mobile earlier this morning I made QSO with Roy – VK6MV beaming long path. Roy was 5/9 at times from Cuballing, in Western Australia coming in very well to Yaesu’s original Field Commander more commonly known as the FT-100. I recieved a 5/5 report which was excellent as I was actually mobile. I also made QSO with Estonia and Italy whilst operating /mobile with the new antenna mounts. The final result looks a lot better than the commercial mounts you see, the new mounts are solid, well grounded, neat, as well as very strong. Over the weekend I celebrated 4 years of romance with my lovely YL Louise M3TLL. I first met Louise at work during the 2005 CQ World Wide DX Contest when we were involved with the STAR Centre project. Louise and I hit it off during the contest and I have managed to continue to catch the yearly contest ever since. I look forward to the CQ WW Contest every year as Louise always supports me by encouraging me to take part in the contest; it reminds her of when and how we met. I guess I am the lucky one when it comes to how we celebrate our anniversary playing radio during the CQ WW DX contest. I sure did get lucky and picked a good one there! Thanks for putting up with me Lou! This Years CQ WW results gave me, 48 DXCC and 15 Zones. 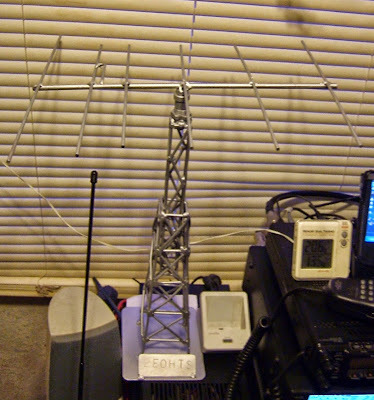 14MHz, 21MHz, & 28MHz were worked using the FT-847 and Hustler 6BTV Vertical. Both 3.5MHz & 7MHz were worked using the FT-767 and a 135 ft Dipole. I made just over 100 QSO and gave away lots of points. Thanks to all participants and for all of the effort you all put in every year, once again I thoroughly enjoyed my anniversary. See you next year and for those that are interested, here are the 48 DXCC and 15 Zones I worked over the weekend. W9RE- 21 MHz- ZONE 04- U.S.A.
K1TTT- 3.5 MHz- ZONE 05- U.S.A. I had a go at making a slightly different mini tower and yagi out of TIG welding wire and this is what I came up with. 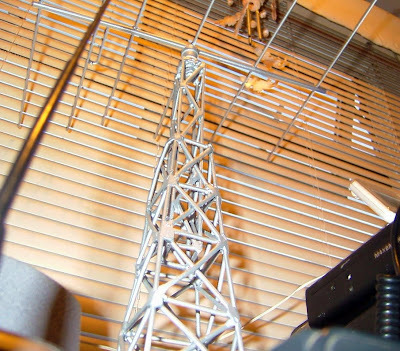 The tower is two sections with a six element yagi antenna that can be rotated 360º simply by hand. The model is made by myself from 3.2mm TIG welding wire which has been built using the MIG welding process. As usual it was fun making it and there is no doubt that I will be fettling up some other project soon. Hope you like it! 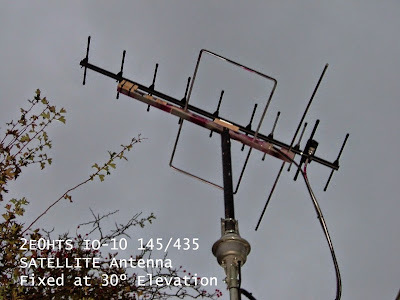 Since I last blogged about the latest tweak with the modified IO-10Element 145/435 dual band Sat Yagi, I've been watching out for AO-51 and VO-52 in order to continue testing the latest antenna. The performance is proving to be excellent both the AO-51 & VO-52 down links have been coming in loud and clear, I have made plenty of QSOs this week after work in the evening. Its been a lot of fun, I am addicted again h.i. IO-10 dual band Sat Antenna. Being content with something is often easier said than done when it comes to Antennas, yes you guessed more messing with the Satellite beam. In the past, the FM Satellite signals that I have received have been very weak compared to the portable outdoor ARROW Antenna. The SSB SATs such as VO-52 & FO-29 have always been stronger and much easier to work compared with the FM Birds whilst using the IOIo Antenna. I have been using the FT-847 Noise Reduction and DIG Filter to assist in pulling out the voices from the FM hiss but still have had a struggle on my hands with most passes. I had another look at my A430S10 Yagi and decided to fix it above the 145 IO Beam using 30mm wooden spacers at a fixed 30º elevation. I have tried 15º, 20º and 45º elevation fixed in the past and have found 30º to be the best compromise. The Compact IO 145 Loop out performed a 4Ele Yagi, I just need an edge on the IO 435 loop. The 10Ele was the answer! A more accurate aim is required which I have now mastered. The combined antenna is working better than expected, it seems like this time I got it right, I am now in the position to be able to hear the FM SATs – AO-51 & SO-50, loud and clear in the shack on the FT-847. Since Installation, I have made plenty of QSO on AO-51 including a first Satellite QSO for M0JMO – Josh, earlier this evening as well as lots of other successful contacts into EU and up and down the UK. RESULT! The FM SATs can now be worked from inside a warm shack as well as out in the cold on the QRP ARROW set up. The new IO-10 145/435 is now very effective on VO-52, my downlink signal is up at 5/9 on all passes between 2º - 60º, and I can get into VO-52 at a distance of 1700 miles with a good signal back to IO93CU. The weather is once again lousy here in N.England so I decided to leave riding the Motor Cycle at home today and drive to work instead. 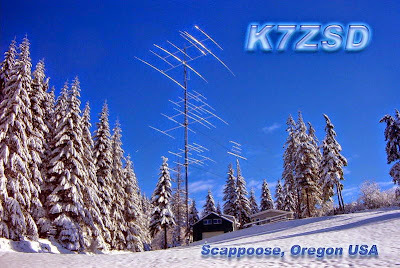 On my return journey back home from work, I came across a nice 5/9+20 signal on 20M which belonged to K7ZSD - Brad, who is located 25 miles N.W of Portland, Oregon in the US. I listened to Brad - K7ZSD working Stations all over Europe as I drove home and decided to give him a call from my mobile Station which worked out great. Brad came straight back to me with a 5/5 report and very good sounding audio from my trusty FT-100. When I got back home I checked Brads call sign on QRZ.com and released why Brad sounded like he was sat with me in my vehicle! Here is Brads - K7ZSD ham station tower array which is so impressive I thought you guys would like to see it. Check out the latest 2E0HTS Satellite video filmed by my YL Louise-M3TLL. This video is aimed at newcomers to the SSB Satellites and shows me using a home made IOIo antenna and a Yaesu FT-847 making Contact with IK3VZS-Italy and LY3L-Lithuania. Both contacts are made on SSB via Earth Orbiting Amateur Satellite - VO-52 and are worked from my home location in N.England. VO-52 was launched on the 5th of May 2005 from Sirharkota (India) and is still performing very well. After work I was out in the garden making the Neighbours look confused as I waved my tripod mounted Arrow into the skies in the search for AO-51. I shouted over to my Neighbour "Signals from space" He looked at me with one of those puzzled looks similar to the ones you get when someone spots your vehicle covered in antenna's, you know the look I mean. He didn’t wait to see what the fuss was all about which turned out to be 3 nice QSOs into Ireland, France and Estonia running just 5 watts QRP out of the TH-F7(uplink) and back into the Ft-470 (down link). I always get a real buzz when outside with the Arrow QRP Satellite set up, I got lucky tonight putting in some good signals from the Moor Top QTH. I will be trying to get in to AO-51 on the next pass which has a possibility of getting across the pond to the U.S as AO-51 will be on a low pass on the horizon with a maximum elevation of only 5 degrees, it will be short quick and I will have a good chance for some QRP DX. 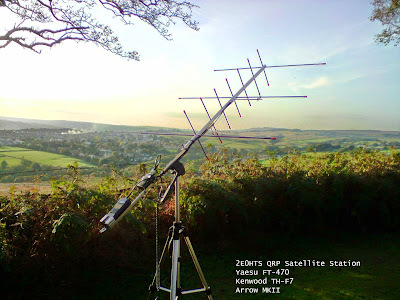 If you are new to Satellites or have recently just got interested in getting into the Satellite side of amateur radio, this site OBSERVATIONS run by GM1SXX - AL and LA2QAA - John has a lot of useful information regarding Amateur Satellite operations and is well worth a visit. 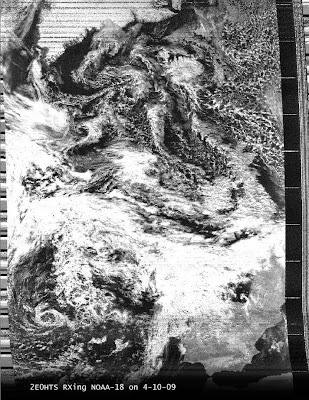 Today's weather image from NOAA-18 on 137.912.5 MHz, received this afternoon as it passed over Northern Europe. You can just make out the U.K in and amongst the cloud to the right of the image. Spain and the Balearic's are easily visible. Since last night we have been suffering from gale force winds which are still hitting us hard up here on the hill. Despite the antennas taking a pounding from the wind and rain, conditions have been excellent on HF with lots of DX stations coming through on 17M, 20M & 40M. Last night (Friday) I was hearing stations from Peru, New Zealand and Stateside coming in strong on 20M. At 21.44 utc I made QSO with Cuba when I worked CO6LC - 5/9 on 20M. 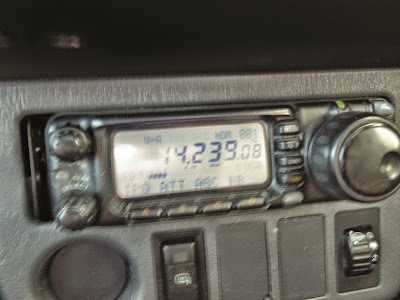 Later on 40M, I heard lots of big signals coming in from the U.S, at 22.31, I came across Richard - VE2ZVZ/P, who was on a camping Dxpedition in the forest of MONTREAL. We managed the QSO with QRM making it difficult at times but still getting there in the end with a 5/5 report. The wind was so bad this morning I had to move one of my Motor Cycles away from a scarily bendy old tree and park it up in a more sheltered space. The WX continued to get worse and during the morning the power lines were blown down somewhere near the local sub station, we had no power for a couple of hours until it was repaired. With the continuous gale force gusts, I am expecting one of the wire antennas to come loose or fall down. Fortunately, I must have done a good job the last time I changed the guy ropes as they are all holding up so far. We decided that with all the excitement and lack of sleep from the howling wind noise all night, it was not such a good idea to do the unnecessary 170 mile round trip to the Ham Fest in such bad WX. We were going for the run out, so instead we went for a more localised drive around and at the same time a play on 20M from the mobile. The band was busy as I drove and it wasn't long before I worked a couple of European stations on 20M (Slovenia and Spain). My 50W signal was doing well getting through straight away with 5/9 reports on the trusty Yaesu Field Marshall - FT-100. 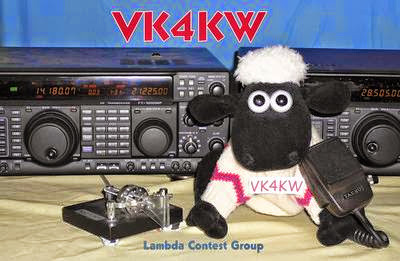 At 12.58 utc on 14.239 MHz, I worked VK4KW in Australia with a 5/9 report from my mobile from nearby to my QTH. 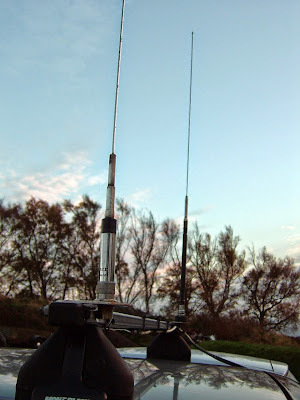 Once again the Yaesu FT-100 HF/VHF Transceiver worked fantastic with the help of the chassis grounded Maldol HFC-20 mono band antenna, performing very well indeed with another good DX contact in the mobile log. Providing that there are no more damaged power lines, I will continue listening out for any DX or any other interesting sounding stations I might receive during the remainder of the weekend. As well as Ham Radio I have always been interested in Motor Cycles and currently have four Bikes in my collection. I enjoy restoring old bikes and I am always tinkering around with something. 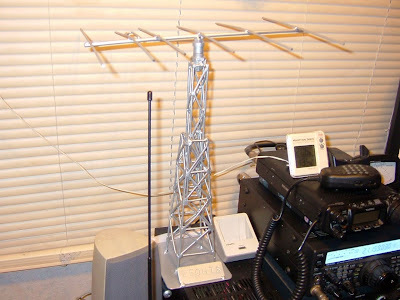 I work in Engineering which has its advantages and comes in useful when building antennas, brackets, masts and most things that can be made of metal. 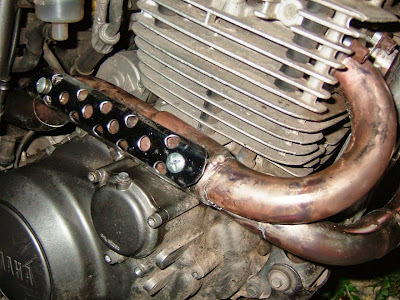 This week, I needed to replace the exhaust on the Yamaha XT600e and had decided to go for a full stainless system which just needed the finishing touch with a matching stainless steel heat shield. The Heat shield is now finished and can be seen in the picture. I have also started to fabricate a light weight alloy radio and antenna mount to fix to the XT600 (Road legal) Enduro bike. I will be continuing with that project in and amongst my other ideas with pictures and info to follow. I should be active on 20M & 2M tomorrow on our way to and from the National Ham Fest from the mobile during the daytime. I hope to be active on the Satellites as well as HF sometime over the weekend from the QTH. I will be posting any activity on twitter as usual, thank you to all my new Twitter followers. 73 have a nice weekend.